Hello and welcome back. Today is the first hardware review for Tekk In Motion. What I am going to review? Well as the title above says I will be review a Wii U Gamepad controller. Here is a picture. Basically the gamepad is a Wii U controller addition that looks like a old Gamecube Controller. It plugs into a Wii controller and you play with it from there. I picked one up because I love the Gamecube controller for Super Smash Brothers. Its not expensive either. I got it for $25 at Gamestop. For $25 you can't expect much but it does exactly what I what I want it to do. The big upside to the controller is that its like the Gamecube controller that I know and love. It fits great in my hands and all buttons are in reach easily. 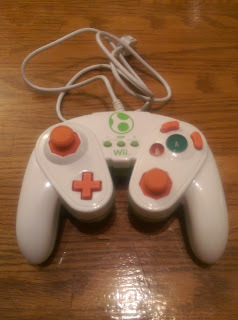 It connects to all Wii controllers so I don't need any adapters that cost a bunch and it comes in the style of several of my favorite characters including Yoshi, pictured here, Link, Mario, and several others. Now for my criticisms and I do have a few. The buttons feel cheap but once again the gamepad is only $25. The sticks have almost no resistance to them. This makes precise movements a little difficult. But my biggest things with this controller is the shoulder buttons. On the Gamecube controller the shoulder buttons stuck out farther from the plastic. I could use the insides of my fingers to hit those buttons quickly. On this gamepad they aren't as prominent. The are closer to the plastic and I have to use my finger tips to press them. This causes me to hit the plastic a lot as the buttons are also closer to the plastic on the gamepad. This has caused me to not actually press the buttons a couple times. If they could change one thing on this gamepad I would say change that. Whats my final verdict? Despite my issues with it the gamepad is still my go to for playing Wii U games. I love the familiar design and I really want to buy the link style one. What can I say I am sucker for Zelda themed items. I would highly recommend this to anyone who wants a different option for gaming on the Wii U. It does look a bit plastic. But as you said game cube :-D. Does the old game cube controller work on the wii u? Unfortunately it does not without an adapter and from I have found the adapter only works for Super Smash Bros Wii U. So I didn't see a point in buying the adapter for one game.